Tokujin Yoshioka’s ToFU lamp is magical. The spare form—a square cut delicately from clear methacrylate resin—conducts light only around its edges, stemming from a single halogen bulb. It is as though light itself is harnessed in the design, caught within and released by the material in a minimal, sensual gesture. The glowing, jewel-like form speaks as much to light as to the void it seemingly creates. The ToFU lamp is a beautiful evocation of contemporary Japanese designer Tokujin Yoshioka’s work. Poetic, inventive, conceptual, and sensual, his work often starts with an exploration into a new material or process. Here, Yoshioka fully maximizes the light-conducting property of methacrylate resin, or PMMA, a transparent thermoplastic. When turned on, the light is transmitted through the material to illuminate only the edges. The material itself seems to recede, resulting in the simple glowing square form. Yoshioka has said that in his approach to design he attempts to “stimulate one’s consciousness—to set the user’s senses free.” In the lamp’s otherworldliness, Yoshioka has also set our expectations—of material performance and what a light can be—free. 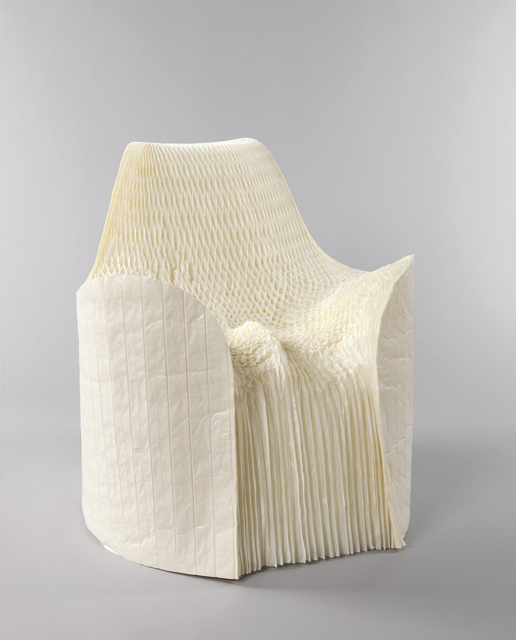 Yoshioka graduated from the Kuwasawa Design School in 1986 and, after working for major twentieth-century Japanese designers Shiro Kuramata and Issey Miyake, established his own design firm in 2000. His practice typifies the structural simplicity and beauty of contemporary Japanese design, while maintaining a conceptual and material rigor. Another of his designs in Cooper-Hewitt’s collection, the Honey-Pop chair, exemplifies this idea.